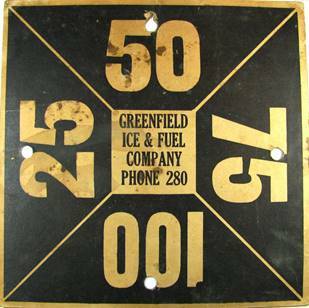 Ice signs were displayed by the customer so the ice delivery man could see how much ice the customer wanted prior to departing his ice delivery wagon to deliver ice to the house. 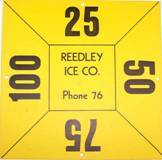 The sign would be positioned in the widow to indicate how many pounds of ice the customer wanted. 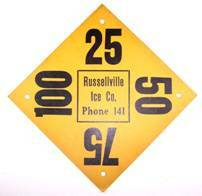 Most of the signs display quantities varying from 25 to 100 pounds. 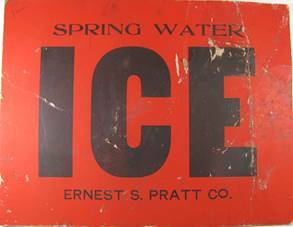 These signs were also advertisements for the ice company, presenting their other products or businesses. 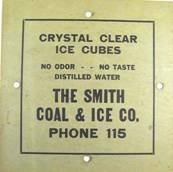 Most of the companies handled other business besides ice, such as coal, heating oil, wood, cold storage, etc. 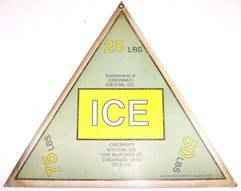 Most of the signs were square or rectangular, however some were triangular and others multisided. 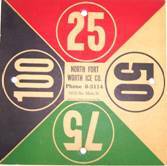 Most are made of cardboard, with some made of metal and wood. 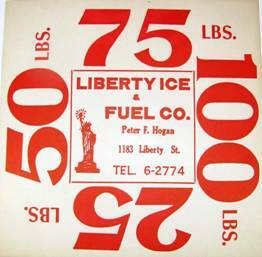 25 lbs,50 lbs,75lbs,100 lbs, LIBERTY ICE & FUEL CO. Peter F. Hogan 1183 Liberty St. TEL. 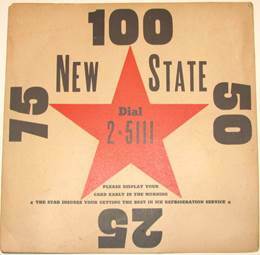 6-2774 with the symbol of the Statue of Liberty. 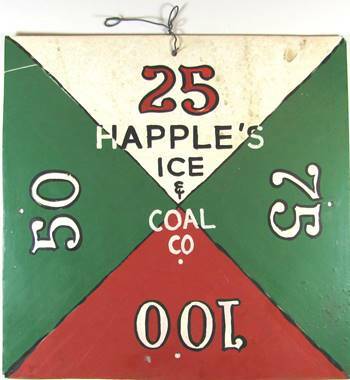 A gift from Gail & Thom Lucia of "Ice Box Memories"
25, 50, 75, 100 HAPPLE'S ICE & COAL CO. 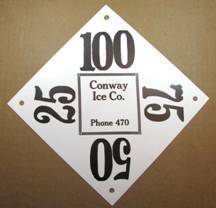 The sign appears to be hand painted on tin. 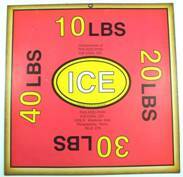 Size - Each side 4-1/2"
Size - 12" - each side. 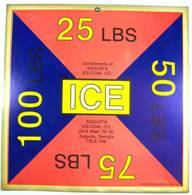 Size - 8-5/8"X8-5/8" with lower left corner cut off to use with the 12-1/2 in the upper right corner. 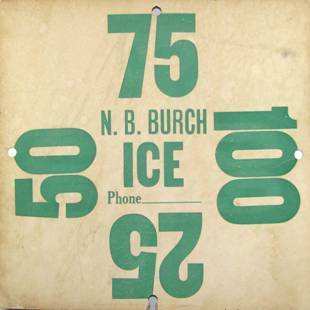 NORTH FORT WORTH ICE CO. This sign appears to be new. 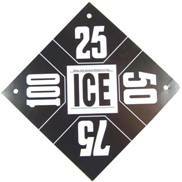 This ice sign is about half the size of a normal sign. MERTON ROLO Tel. 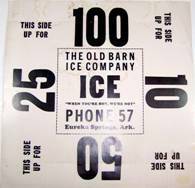 1387-M, 15c, 25c, 40c, 50c ICE and THERRIAULT PRESS in very small print. Printed by the Therriault Press in Nashua, NH. 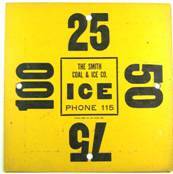 THE SMITH COAL & ICE CO.
Also shown are some 25 and 50 pound tickets for the Smith Co. 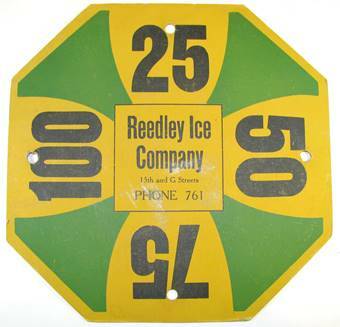 These were used to pay for delivered ice. 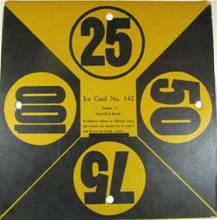 25, 50,75, 100 positioned to indicate the amount of ice the customer desires. 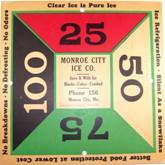 Marked in the center of the card is - Ice Card No. 142 design 1, Carried in Stock, If different figures or different colors are wanted, se designs No. 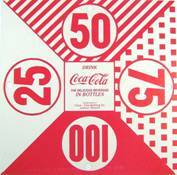 3, 4, and 5 and do not use design 1 price. 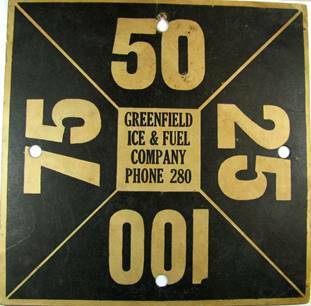 GREENFIELD ICE & FUEL COMPANY PHONE 280 25, 50, 75, 100 Same marking on back side. 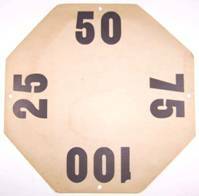 Notice the numbers increase clockwise on one side and counter-clockwise on the reverse. 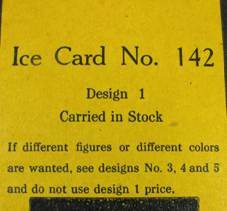 At first I thought that was odd, until I realized this arraignment of the numbers one could tell when looking at the back side of the card they knew what number is up and exposed to the Ice Man. One side has some smudge marks. 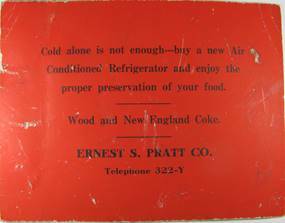 Cold alone is not enough---buy a new Air Conditioned Refrigerator and enjoy the proper preservation of your food. 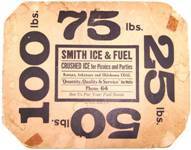 Bloomburg Ice and Cold Storage Co.
2021 Bay Street Taunton, Mass. 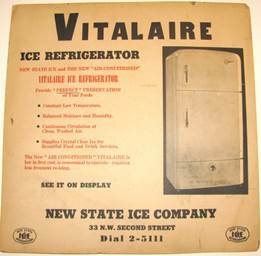 Vivian Manufacturing Co, St. Louis, Mo. hanging points. 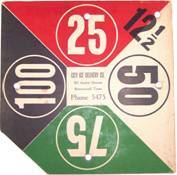 The 50 side is stained from exposure.